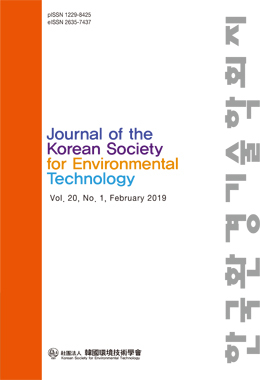 본 연구에서는 확산모델을 이용하여 시흥스마트허브 내 미세먼지(PM10, PM2.5) 주요 오염원을 기준으로 배출된 미세먼지가 주변지역으로 확산되는 특성을 분석하였다. 그 결과, 모든 지점(A-1~A-6)에서 주풍향에 따라 서풍과 동풍계열에 의해 양방향으로 확산되는 것으로 예측되었고, 특히 서해안쪽에서 불어오는 바람과 내륙에서 부는 바람이 공존하는 지리적인 특징으로 인해 오염물질이 멀리 확산되지 못하고, 배출원지점 인근에 머물러 있는 것으로 예측되었다. 또한, 계절별 PM10의 확산 특성에서는 A-3 지점에서 대체적으로 정체되어 농도 수준이 높은 것으로 나타났고, 주변 주거지역에 미치는 영향은 낮은 것으로 예측되었다. In this study, the dispersion characteristics of particle matter(PM10 and PM2.5) discharged in the industrial complex(Siheung Smart Hub) were analyzed based on the pollution sources of particle matter. As a result, it was predicted that it spread in both directions by westerly winds and east winds at all points (A-1~A-6) according to the main wind direction. Especially, it is a geographical feature that winds blowing from west coast and winds blowing from inland It was predicted that the pollutants could not spread far enough and stayed near the source site. In addition, the dispersion characteristics of PM10 in season showed that the concentration level was generally stagnant at the A-3 point, and the influence on the surrounding residential areas was predicted to be low.